Use Marble Remnants for Bathroom Countertops and save money! 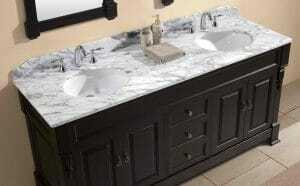 Did you know you can save money on bathroom countertops in Tampa Bay by using marble remnants? If you have a home remodeling project coming up, using marble remnants can save you a lot of money. Over the years, most people in the United States have come to realize they can be able to save a lot of money when they make use of stone remnants such as marble. Typically, buying a full marble slab range for a standard size bathroom countertop will be extremely costly. Of course, you will also need to factor in the cost of fabrication which can significantly increase the total cost of installing a marble bathroom countertops in Tampa Bay. Most people will abandon the project totally to avoid these costs. Fortunately, there is a better alternative that allows you to have a marble countertop at a pocket-friendly cost. 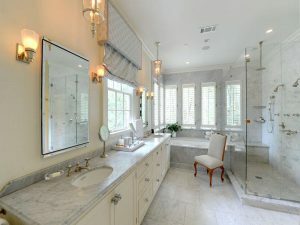 Why Choose Marble for Bathroom Countertops in Tampa Bay? Appearance: If you are looking for luxury and sophistication in your kitchen or bathroom, you can easily achieve this by installing a marble countertop. Marble has a classic look which sets it apart from other stones. Without a doubt, marble countertop will add warmth and elegance wherever it is installed. Variety of Colors: Marble slabs come in a variety of colors. You can choose from whitest of whites, pink browns, red, deep onyx blacks, and vibrant greens. This means that marble can easily fit into the decor you already have in place. Uniqueness: The uniqueness of marble as a natural stone will bring unmatched beauty to any place it is installed. This is one of the reasons why marble countertop is a common sight in most restaurants and hotels. Durable and Long Lasting: Marbles are extremely durable. As of today, you can still find structures built with marbles decades ago that are still standing. Without a doubt, marbles come with a lot of benefits that you cannot ignore. With all these benefits listed above, it is obvious why a full slab of marble can cost a lot of money. Fortunately, you can be able to save money on your next home remodeling project by getting marble remnants in Tampa Bay from marble suppliers. A marble remnant is a piece of material that was left over from a previous countertop job. Please note that these have no defects. Typically, they weren’t used because they didn’t fit in with the kitchen or bathroom that was cut out of the slab. Generally, it is recommended that you make use of marble remnants for smaller projects. Doing so will save you tons of money. Typically, marbles are sold by a slab. What this means is that even if you need just half, you will have to buy the full slab. However, the remnants provide you the best option to have the marbles you need without buying full slab while at the same time be able to save money. Don’t give up on the dream of having marble countertop in your kitchen or bathroom; you can still be able to live this dream by getting marble remnants. In some cases, you can still make use of marble remnants in larger projects. Take for instance you are doing your bathroom kitchen and your powder room; remnants will be a perfect fit especially when you don’t have enough material left from your kitchen to cover both areas. You can also make use of remnants when you want to have a different material for your vanity top or island. Where to Buy Marble Remnants in Tampa Bay? Fortunately, you can easily buy marble remnants in Tampa Bay, which will help you to save a lot of money. You can get it from countertop companies that are fabricators and installers of marble in Tampa Bay. Make sure that you are getting your marble remnant from an experienced company. Only quality companies will be able to offer you quality remnants with no defects at a price you will be very happy to pay. Here at Tampa Bay Marble & Granite, we offer great deals on quality marble remnants. We are a factory direct countertop company. We offer the best quality and prices in the area and have marble remnants at our location for you to view today. Give us a call to schedule an appointment or stop down today to see our selection.